In today’s high-tech, hyper-busy, work-at-home, Netflix-bingeing culture, consumers aren’t as interested as previous generations in solving their “dinner problem” by going out to eat. Hence, the years-long decline in visits to restaurants at dinner. Recently, however, operators who are finding a way to solve that problem are experiencing growth, according to market-research firm The NPD Group. “It’s very nominal growth, but it’s a change in direction,” said David Portalatin, NPD vice president and food analyst. With industry traffic hovering between a 1-percent increase and flat for several years, dinner was the only daypart to grow this year. In the first quarter of 2018, dinner visits rose nearly 1 percent, followed by a 0.5-percent increase in the second quarter, NPD found. Helping to drive traffic growth at dinner is delivery, which is used most heavily at dinner, and dinner menu offerings from popular chains. While the growth at the dinner daypart can mostly be attributed to larger chains, due to their size and sophisticated and abundant resources, NPD data indicated that there are some smaller, emerging chains doing well, too. “There are pockets of creativity among smaller, emerging operators,” Portalatin said. According to NPD Supply Track data, micro-chains with three to 19 units are growing purchases from broadline distributors at a higher rate than large chains. Micro-chains increased case-volume purchases from broadline distributors by nearly 5 percent in the 12 months ended May. During the same period, large chains only increased casevolume purchases by roughly 2 percent. Additionally, 49 percent of all meals are consumed at home, NPD found. Not coincidentally, restaurant meals eaten at home are also up. As for what consumers are eating at dinner, Portalatin said there is increasing demand for in-home meals that skew healthier. He pointed to the emergent trend of “blended meals,” those comprised of prepared items purchased from a restaurant, grocery or convenience store and ingredients or dishes already in the home. By simply being a part of the solution, Portalatin said restaurants can meet consumers’ new dinner needs and grow their business. While sandwich concepts are often seen as lunch-only options, Which Wich founder, CEO and chief vibe officer Jeff Sinelli is looking to “shatter that mentality” with its soon-to-launch Pizzawich. 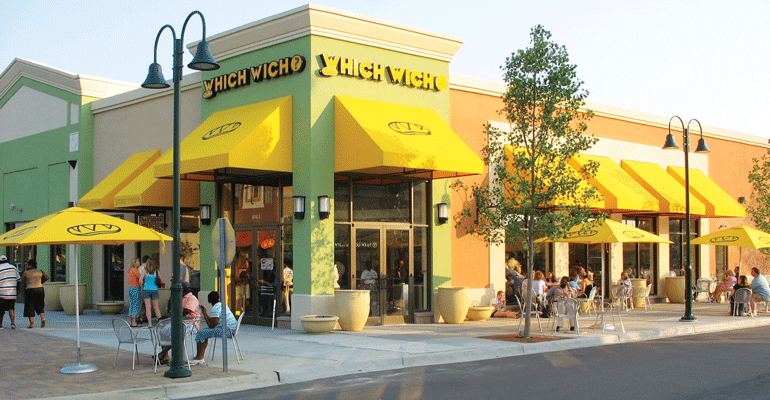 As with all Which Wich innovations, Sinelli said the goal here is to help franchisees be successful at all dayparts, and to give guests more options based on changing tastes. While the intention may not necessarily have been to drive dinner traffic, that’s what happened when Lexington, Ky.-based A&W Restaurants began testing online ordering in four locations earlier this year. The test results so far reveal that guests are ordering future orders earlier in the day for later pickup, according to a spokesperson for nearly 100-year-old, “All-American Food” chain. To promote the launch, A&W has been using Twitter to circulate a 20-percent discount code for customers willing to try ordering their favorite burgers, cheese curds, root beer floats and more from a computer or smartphone. In August, A&W, which operates more than 630 U.S. locations, plans to expand the online ordering test to 30 locations.